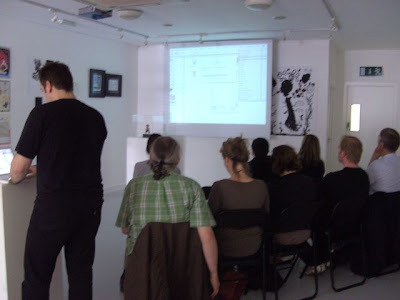 Last Saturday 19th July I did a workshop/talk as a complement to the Illustrating Illustration exhibition. I showed a few projects from beginning to end. The idea was to emphasize the principles of the exhibition and to give an insight into how projects are approached. The event was promoted though the Artlinks! network and the Arts Office in the Kilkenny County Council. It was directed to professionals in any visual communication area. We also wanted a reduced number of attendants so we could go in depth into any of the issues that might arise. Two days before all seats had been taken. Thanks to everyone who attended the workshop which I hope was of interest (I would say so looking at the feedback we've had). Especially all who travelled specifically for the event from Wexford, Enniscorthy, Dublin and Cork... and, of course, thanks to the locals who also were there. Posted by Alé Mercado at 12:04 a.m.